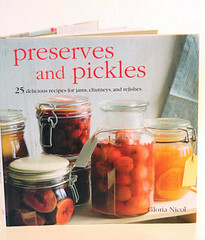 Preserves and Pickles is a book dedicated to jam and jelly making, preserving and pickling. Not only are there recipes for the classic raspberry jam, lemon curd and apricot chutney, there are some exciting new recipes such as tutti frutti jam and lemon & fig marmalade. The book is by Gloria Nicol, a journalist and photographer living the good life in rural Britain. She has a online shop selling vintage homeware and linens, plus a blog with categories from foraging to canning. 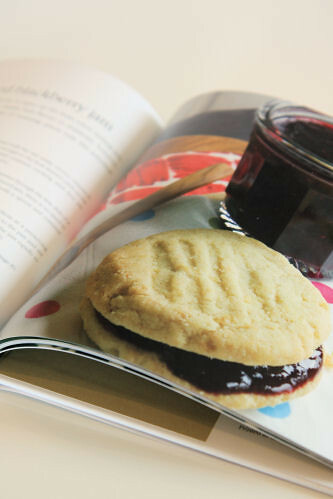 The book takes us through the basics of jam-making and preserving techniques, there's also a problem solving section - did you know that your jam can shrink in the jar because it has been inadequately covered or sealed, or hasn't been stored in a cool, dark, and dry place? Many of the recipes will come into their own during the summer months, when ripe fruit is in abundance. There is something rather satisfying about popping open a jar of jam or pickle, that amazing scent providing us with memories of bountiful past seasons. 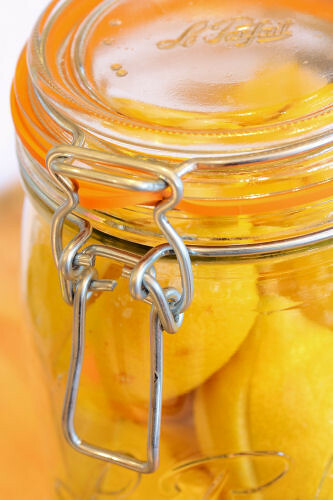 I chose to make something new to me, preserved lemons. 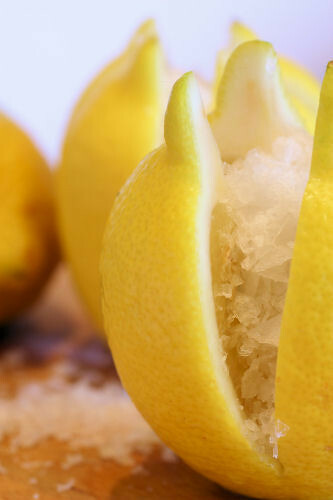 Basically, you just carefully slice into the lemons, and open them out slightly before filling with coarse sea salt. 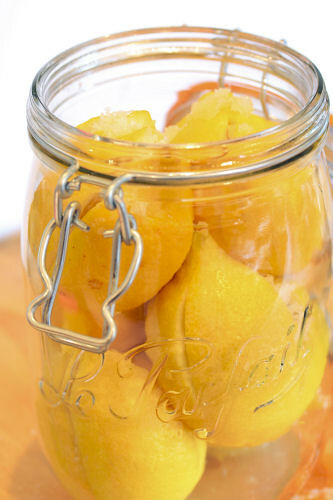 Pack them into a sterilised jar, you can flavour with chilli peppers or coriander seeds, then press down on them for a few days before adding more lemon juice and then leaving for a month to soften. How easy is that! 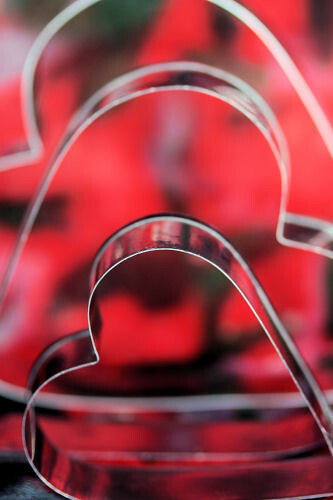 Mine have been in the jar for a couple of weeks now and I'm itching to use them in some Moroccan recipes. If you grow your own fruit and vegetables, or come home from the farmers' markets with overflowing bags of fresh produce, this book will show you how to make the best of the glut, and come Christmas, you could be opening a jar of crab apple & vanilla curd! The book can be bought directly from Cico Books, Ryland Peters & Small, or from Amazon. I know, it's like trying to catch a bus around here, you don't get one for ages and then several come along in quick succession! 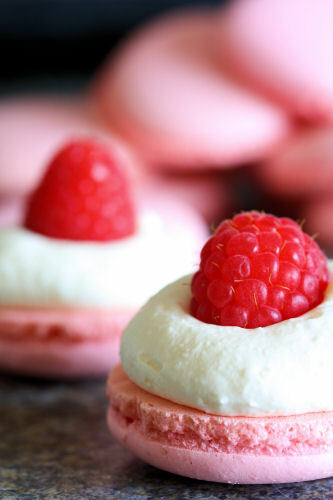 I'm talking about my macarons though, and these are filled with white chocolate cream and fresh raspberries, perfect timing for 'V' day! 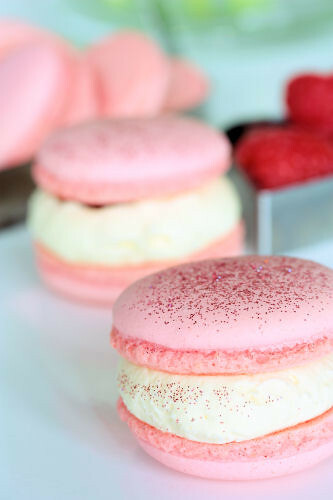 I tried a new recipe, using the Italian meringue method and it made the smoothest, most beautiful macarons I have ever turned out + the messiest stickiest kitchen I have ever had! 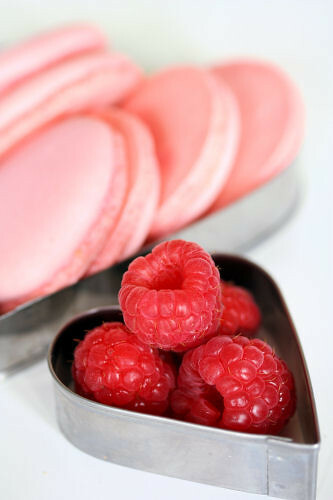 The recipe was from Not So Humble Pie, a fabulous blog with a great macaron trouble-shooting guide. Melt the chocolate and leave to cool, but but don't let it set hard. Whip the double cream until stiff and fold in the cooled white chocolate. 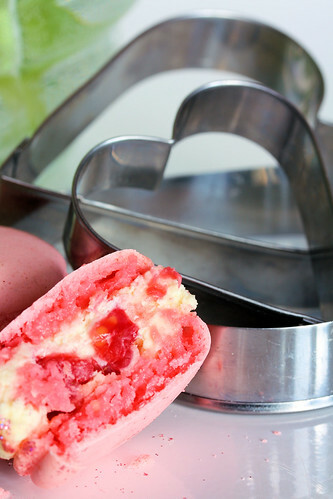 Pipe the cream onto the macarons and add a raspberry. Top with another macaron. These can be refrigerated for a couple of days. It's HERE! 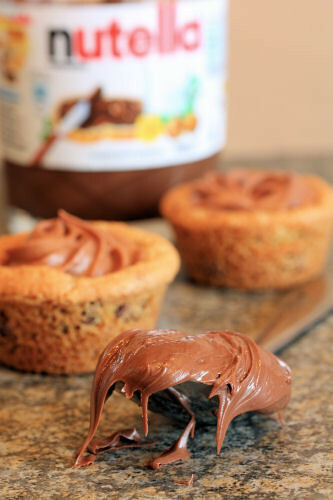 World Nutella Day 2011! 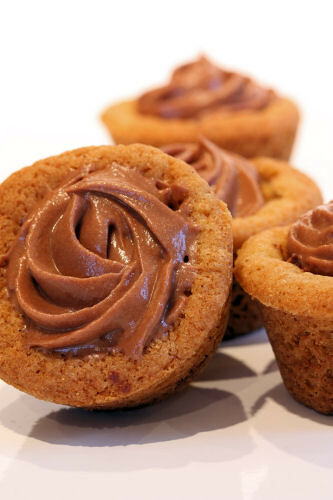 And to celebrate I've made some little Nutella cookie tarts. 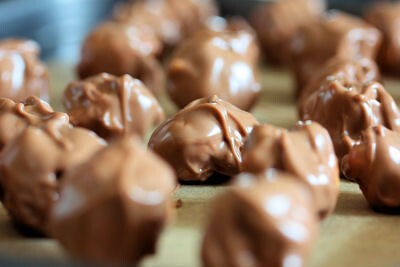 I saw this idea over at Tulip's Kitchen ages ago, here is my version made with Nutella cream. Just a rough recipe, quantities depend on how many you want to make. 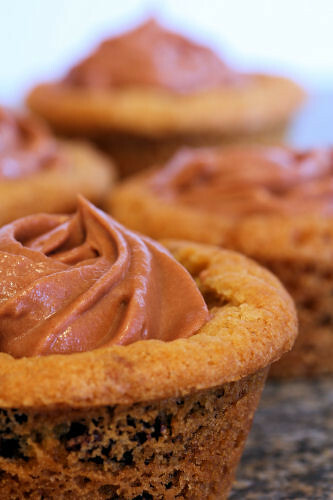 You need a mini muffin tin for this recipe. 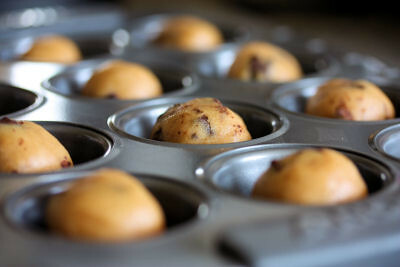 Make the cookie dough and roll it into 1" balls, size depends upon your muffin tin. Put the dough balls into the tin and bake for about 10-12 minutes. Take out of the oven and while still warm, indent the dough with a round implement - I used a small pestle from a pestle and mortar set - to make the tart shells. Leave to cool. Whip the double cream and add the Nutella. You can add the hazelnut liqueur at this stage if using. 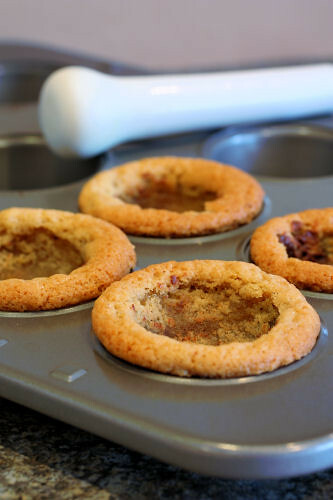 Pipe or spoon the cream into the cooled cookie dough tart shells and serve, or put in the fridge to serve later.